Jourdanton Police Officers were recently made aware of individuals who were obtaining handicapped placards and selling them for a profit. Jourdanton Police Department (JPD) Officer Timothy Sawicki followed up on this information and found a local individual in possession of multiple handicapped placards that were not issued to him. Evidence gathered showed that he had purchased these handicapped placards illegally. 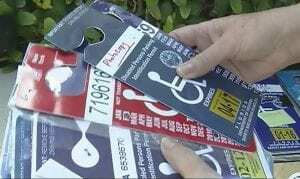 Further investigation led to the person responsible for selling these handicapped parking permits. Salim “Jimmy” Merchant was arrested by Jourdanton Police on July 21 and charged with “Tampering with a Government Document”. The same day, in coordination with the JPD, Brenda Lopez was arrested by Atascosa County Sheriff’s Deputies on the same charge. Both suspects face up to one year in jail and a $4000 fine if convicted. Officers are continuing to follow up on other leads in this ongoing case that may include additional suspects. The State of Texas has made laws to assist those who are disabled by allowing them to park in parking spaces that are close to the entrance/exit of most businesses. For those with a legitimate physical mobility issue, permits to park in these well-marked spaces can be obtained at our county tax office.